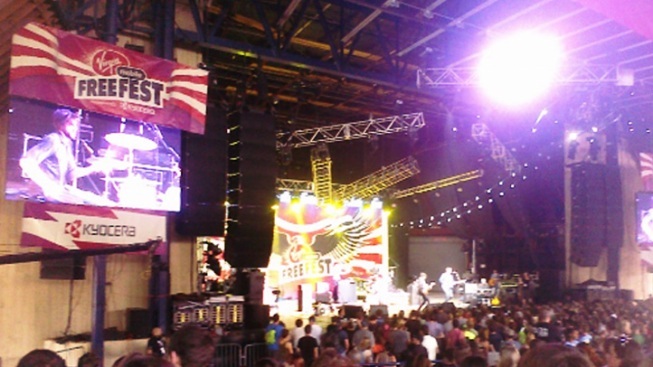 No word yet on who's playing this year's I.M.P.-booked Virgin Mobile FreeFest at Merriweather Post Pavillion, but we now at least have a date: Saturday, Oct. 6. And it'll still be free, if a little crisper. "I just can’t wait to see what our Dance Forest looks like in all that fall foliage," says Virgin Mobile USA brand honcho Ron Faris in a press release Friday, subtly acknowledging the festival's later-than-usual date. Twitter Fans who follow Virgin Mobile Live (@virginmlive), Virgin’s culture and music feed, can be a part of the 2012 Virgin Mobile FreeFest line-up announcement by guessing which bands have been selected to appear at the festival. To enter, participants will need to follow @virginmlive on Twitter, add the official festival hashtag #VirginMobileFreeFest, and include their guess of which band will appear on the bill (also using a hashtag). Random winners will be contacted with further instructions to announce the lineup. Naturally, fans featured in the announcement video will also win VIP tickets to the FreeFest. Here lie the contest rules. My totally-out-of-left-field local guesses: The Dismemberment Plan and Wild Flag. Virgin Mobile FreeFest Set for Oct. 6, Will Include More Foliage was originally published by Washington City Paper on Aug. 3, 2012.